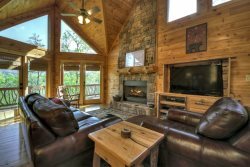 Its the perfect cabin for your get away into the North Georgia Mountains! Situated mere steps from Fightingtown Creek, Sweetwater Getaway is located just 20 minutes from the great shopping and scrumptious eats of historic Downtown Blue Ridge but is nestled in the shady wilderness of the North Georgia mountains. Leave your stresses at the door and allow them to be swept up in the gentle rapids of Fightingtown Creek, as you make your way down the paved driveway leading to Sweetwater Getaway. Invigorating knotted pine and faint smoky whips of the stone-accented wood burning fireplace will greet you on the entry level living area. You’ll find all the comforts of home at your fingertips: 32-inch flat panel TV, full kitchen, dishwasher, dining area for 6, and coffee maker. Both bedrooms include queen size beds, views of the creek, and warm, inviting decorations. The bathroom features a shower/tub combo. Step outside on your covered porch for a relaxing, unique outdoor living experience. Cook for friends or family on the propane grill, and enjoy the outdoor seating as you drift away to the natural music of Fightingtown Creek. Take a short stroll and sit on the swinging bench, or go for a cooling dip in the creek just a few strides away from your cabin. No matter how long you stay, you’ll feel right at home in the North Georgia Mountains at Sweetwater Getaway. Located about 20 minutes from downtown Blue Ridge, on Fightingtown Creek. Within walking distance of A Whitewater Retreat. Everyone was so friendly and knowledgeable, from making reservations via the phone to check in. My husband was so impressed with the lady at check in and how nice she was during the process. Can't wait to stay with Southern Comfort cabins rentals again!!! Sweetwater Getaway was the perfect get way rental for our family. We spent so much time on the screened in porch overlooking the rushing creek. Our kids were happy that we had WiFi access at the cabin and loved the bunk beds in the second bedroom. We enjoyed eating at the dining table while hearing the river just outside. The only complaint we had of the rental was the shower faucet needs repairs because you can't adjust the water temp, it's either too hot or too cold. And it also affects the water pressure. Other than that we enjoyed every minute during our stay at Sweetwater Getaway. By far our favorite cabin weve rented. Clean..tastefully decorated..new appliances and furniture. Great location that keeps you busy so you don't have to leave to explore elsewhere. As always Southern Comfort Cabins has not disappointed. We normally visit during Thanksgiving, but decided to something a little different than the norm. We stayed at Sweetwater and the sounds of the water rushing was so calming. The hustle and bustle of work was way behind, the serenity and peace of the mountains can not be described, but lived. We recommend to everyone, that a trip to the mountains will have you longing for more. We are planning our Thanksgiving return trip already. Sweetwater as a prime location. Fishing, kayaking right outside the door. What more could you ask for. Well maintained cabin. Just sitting in the screened enclosure made the trip worthwhile. Upon arrival we were greeted immediately and treated with the utmost respect. The knowledge and advice of the team was excellent and on point for our needs. We have never stayed in cabin before so this was all new to us. I honestly can say I can't wait for our next visit to Blue Ridge for a 6 day vacation instead of a 3 day. Our associate was well informed, prompted, and a pleasure to work with. Love it! Hope we can return again. Everyone was very pleasant and knowledgeable. Recommended several places to eat and things to do. We thoroughly enjoyed staying in this cabin, very quite and peaceful. Great for a relaxing getaway! team members were very polite and helpful could not have been better. I would like to say thank you we will be back. we enjoyed our stay the cabin was lovely we enjoyed the creek this was one of the most peaceful and relaxing vacations we've had in a long time very much needed we will be back. Walking distance to "A Whitewater Retreat"